Ice is a Christian alternate history novel. The astronauts in a fictitious 1975 Project Apollo mission find themselves stranded on the Moon. They then strike out on their own and make a discovery that could, if widely reported, change the way that humans view their world and its history and pre-history. The astronauts, in their desperate travels, discover a vast quantity of water in the form of ice that, quite simply, shouldn't be there. Astronauts Gary Lucas and Charlie Shepherd are completing their Apollo 19 mission to the Aitken Basin (which, in the novel, has a fictitious name) near the south lunar pole. But when the time comes for them to lift off from the moon, their Lunar Module ascent engine fails to fire. Mission Control suggests several increasingly desperate measures to try to get that engine to fire, but all these measures are futile. Finally, Lucas and Shepherd decide to abandon their LM, climb into their next-generation lunar rover, and strike out on their own. They enter the basin and thus fall out of communications range with earth. As they keep driving, they find themselves driving on an impossibly flat and level surface. They soon determine that they are driving on a solid lake of water ice—but how such a vast quantity of water came to be on the Moon, or why it did not sublimate away, they cannot possibly explain. Eventually the rover's batteries give out—but not before Lucas notices a stray glint of metal against the rover's headlights. First Lucas, and then Shepherd leave the rover to investigate—just in time, as the lake melts and nearly drowns Shepherd as he is walking. In time, each astronaut discovers the pressure-suited remains of another astronaut, who in life looked human, except that he stood eight feet tall. This astronaut has committed suicide by taking off his glove. His footprints remain, and the astronauts, following them, discover the most incredible out-of-place artifact ever found: a vast, and still functioning, base on the moon. They barely manage to enter and trigger the base' airlock before they run out of oxygen. After resting, they doff their heavy backpacks and enter the base. They discover evidence that the base' crew were as giant-sized as was the suicide they found outside, and that they commanded a technology that ought to have enabled them to conquer the earth with ridiculous ease. They further determine, from the condition of some of the base' luxurious furnishings, that the base must be centuries old. All these puzzling facts create a crisis of interpretation. Lucas is by now convinced that the base' crew were extraterrestrial in origin, a proposition that Shepherd, a committed Christian, cannot accept (because the Bible has no warrant for such a thing). The alternative, this being during the Cold War, is not much more acceptable: that the Union of Soviet Socialist Republics managed to build a base of such tremendous size with no one at NASA or the CIA being any the wiser. The astronauts explore further and find even more wondrous technology. They then make two gruesome finds. First they find a wrecked storeroom, filled with broken furniture and smashed equipment. Percussion charge burns scar at least one wall. Several members of the base' crew lie dead, apparently of mutual murder. And in a dormitory room, they find another suicide, and a collection of room art—including multiple scenes of torture—that suggest that the base' crew came from a culture that has no humanitarian values to speak of. The next day, the astronauts are separated. Shepherd misses his friend after he stops to shave himself in one of the empty dorm rooms. In his initial search for Lucas, Shepherd walks into a horrifying site: a sacrificial temple, with the body of a dead crewwoman lying on its altar. Shepherd searches the complex only long enough to verify that Lucas is not lying dead or injured in the altar pit or the holding pen for the sacrificial animals. Eventually Shepherd finds the base' mess hall—served by a still-functioning semi-automatic combination food dispenser and waste-bussing station. With his food and water supplies assured, Shepherd turns to his primary concern: finding his friend. But all he finds is an athletic court that, when last used, had been the venue of a very violent and bloody game. Shepherd returns to the base' central control room, or "war room," and activates another console—which presents him with the base layout, and one room he hasn't explored: the hangar. Shepherd goes there—and finds no stored craft and no sign of his friend. In frustration, Shepherd visits the war room a third time and activates all of the consoles. Unknown to him, one of those consoles is the main console of the base' central computer. It in turn evaluates him as an intruder and sends an urgent repeated call for help. A call directed toward earth. That message will prove the astronauts' salvation, for NASA hears it. Though no one at NASA can read the message, they trace it—directly to the Aitken Basin. This prompts the launch of Apollo 20, with orders to recover what everyone assumes will be Lucas' and Shepherd's frozen corpses. For his part, Lucas, as far as he is concerned, is no longer on the base. He is on the home world of the base' builders—a world wracked with worsening civil disorder, and whose people are sacrificing one another to their pagan gods. Lucas saves a woman from a violent attack and falls into the hands of the sacrificial priests—but then two men, disguised as fellow priests, bribe his guards and "buy" him for themselves. But they are not acquiring him for sacrifice; they are rescuing him. These two men are in fact the husband and brother-in-law of the woman he himself had rescued earlier, and all three are part of an eight-member household presided over by a very old but very wise-looking man. Though he cannot understand a word of their language, he understands enough from their gestures to know that they are very grateful to him. To return their generosity, Lucas offers to join the workforce now completing work on a vast rectilinear barn in which his hosts are storing the vast quantities of grain that they are currently harvesting. His job is to apply a pitch-like resin to the walls of the barn, which are made of an advanced-looking wood composite. A few days after he begins work, the ninth member of the owner's household, whom Lucas did not know about, dies. What relationship the dead man is to the owner, Lucas cannot determine because of the language barrier—but he still attends the man's last awake moments. That done, it's back to work. Then Lucas accidentally falls from the scaffold and is now incapacitated. The family take him inside—and then begin a debate that leads Lucas to believe that the family is about to expel him for some reason. The next morning, Lucas awakes to find nothing wrong with him beyond some sore muscles—but he is also alone on the farm, with nothing but the barn to keep him company. Then a vast wall of water rushes toward the barn. Lucas hastily climbs a nearby tower and watches as this water spills over the barn, and then lifts it off its foundations. Lucas barely has time to realize that what he thought was a barn is actually a barge, when the barge strikes the tower he has climbed and throws him into the water, which is scalding hot. Shepherd, meanwhile, strives to activate one console that has earlier resisted his efforts to activate it. The console speaks to him in a language that he can't understand, but in a very insistent and ultimately ominous tone. Shepherd soon realizes that he has triggered a self-destruct sequence, when system after system on the base begins to shut itself down, beginning with the artificial gravity and ending with his food and water. Lucas goes from nearly drowning to finding himself, as he supposes, back in his room aboard the moon base. This time, however, the base' crew are present. To begin with, the crew are watching the apparent destruction of their home world. Dissension grows in the ranks and leads to utter panic. One crewman steals one of two levitating spacecraft from the base' hangar. The others fight over places in the remaining craft. Several of them shut themselves up in a large storeroom, where at least one giant fires several rounds, twice. Lucas listens for the sound of retreating footsteps. He then enters that room. He discovers that room in the same wrecked state he remembered first seeing it, only this time the smoke from the percussion charges lingers, and the dead bodies are still fresh, not mummified as he had seen them before. This means the mutual murder scene he and Shepherd found earlier, has only now taken place, with Lucas only seconds away from having witnessed it, or dying in its crossfire. Lucas now concludes that he has traveled back in time. Lucas searches desperately for his friend. In the process he bursts into the sacrificial temple Shepherd has found in the real world. Here Lucas watches as the remaining base crew sacrifice one of their own to their pagan god in a vain attempt to halt the destruction. After watching that, Lucas shuts himself in his room. He comes out only long enough to start a systematic search of the entire base. He does not find Shepherd. He now concludes that he is in the past and Shepherd is not. But at least Shepherd is safe, away from the deadly drama of mutiny, mayhem, and murder that Lucas finds himself in the middle of. Finally the violence is past, but only because almost everyone on the base is dead or fled. (In fact he opens the door to the dorm room where he had found the dead man, and now sees the man recently dead, his blood pooling and flowing almost to the door.) The moon now suffers an intense meteoric bombardment. Lucas knows this will produce the multiple craters and "seas" that are present on the Moon today. Lucas walks to the central operations room or "war" room. There he discovers the base commandant, but can only watch as the commandant dons a pressure suit and goes outside—to commit suicide. Lucas now suffers an attack of vertigo, and wakes up on a Skylab rescue vehicle. Shepherd is also present, as are the three-man crew who have rescued them. Shortly after they complete their trans-Earth injection burn, a thermonuclear detonation takes place in the Aitken Basin. The self-destruct sequence has run its course, and the base has blown itself off the face of the moon. Upon their return to earth—and reunion with their grateful wives—each man must independently resolve a personal crisis. Shepherd's faith has suffered a challenging test, because he cannot explain the base in light of the Bible's implications that humans are the only intelligent people in the universe. But Lucas surprises Shepherd by announcing that he has become a Christian himself—and has realized that, by whatever mechanism (not time travel, but an incredibly realistic holographic simulation), Lucas has witnessed the Great Flood of Noah. He has even eaten at Noah's table, helped him finish his Ark, and attended the death of none other than Methuselah, Noah's grandfather. The base they found was built by human—and specifically antediluvian—hands. Johnson wrote his novel before the current age of cloud storage and streaming. An event as violent as the Great Flood, happening today, would necessarily destroy all cloud and streaming services. The lack of any hard-copy archives would, of course, mean the event would destroy all stored content. If antediluvian civilization had fully embraced cloud storage and streaming, none of the content in such storage would survive. Furthermore, since Ice went to print, Walter T. Brown has greatly expanded his own estimate (the Hydroplate Theory) of the violence of the Great Flood. To be more specific, Brown would certainly agree that ejecta from the subcrustal oceans would in fact bombard the Moon within days of the Flood, as Astronaut Lucas experiences in the holographic simulation. Furthermore, Brown guesses that the Earth ejected two to four percent of its mass into space. That extra mass persists as the meteoroids, asteroids, comets, and Trans-Neptunian Objects we know today – and likely most of the moons, large and small, of the gas giant planets of our solar system. An event as violent as that would surely destroy every ground building that stood before the Flood, and every ship, except only a ship built according to a Divine design. Ice makes allusions to the television series Star Trek and to the motion picture Doctor Strangelove, Or How I Learned to Stop Worrying and Love the Bomb. The two astronauts make the allusions as they try to make sense of the advanced technology they find. Shane Johnson had originally intended to write another novel, titled Fire, as a sequel to this novel. 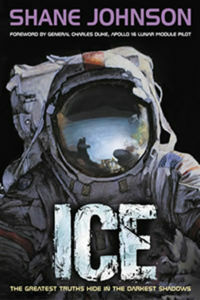 Ice ends with the manned space program now fully funded, Astronauts Lucas and Shepherd submitting to a debriefing by a secret committee concerning their experiences aboard the lunar base, and the description of the open doorway to a base of similar construction on Mars. But Mr. Johnson was never able to sell that project, and has since had to change publishers. This might in part be due to an extreme reluctance, on the part of the Christian Booksellers' Association, to support science fiction projects, even faith-based ones. No other work of fiction or theater has made any allusions to this work. This novel recounts a modified J-class mission profile from Project Apollo. It also makes references to certain launch vehicles that were planned for later lunar exploration projects, but never used. Furthermore, the novel makes allusions to the institution known originally as the Manned Spaceflight Center and today as the Johnson Space Center in Houston, Texas. Multiple historical figures, most notably Gene Kranz, the famous Project Apollo flight director, appear in their historical roles. Perhaps the most poignant allusion of all is to Mr. Kranz' habit of wearing a white vest while on watch for the duration of an Apollo mission, the notion being that the vest was a mystic talisman that protected the astronauts while in flight. When only one man returns from Apollo 19, Kranz tears his vest down the middle and throws it to the floor of the Mission Operations Control Room. The author might or might not have intended, in addition to alluding to Gene Kranz' vest, to allude as well to the ancient Hebrew custom of clothes rending as an expression of mourning or other deep sorrow. The water ice on the Moon is an actual finding suggested by the NASA unmanned probes Clementina and Lunar Prospector, though the finding is disputed. NASA and the Indian Space Research Organization are now (as of 3 June 2009) planning a joint mission to investigate both Lunar polar regions, including the Aitken Basin, further to provide definitive confirmation. The allusion to the Great Flood is obvious. Less obvious is the suggestion that antediluvian civilization commanded an advanced technology that might seem extraterrestrial in origin. Critical reception was limited to a few critics specializing in Christian works. Sales were mediocre. This novel was nominated for the Christy Award for best futuristic Christian novel for 2002. ↑ Personal interviews taken at the Greater Philadelphia Christian Writers' Conference, August 9–12, 2006, by User:TerryH. The persons so interviewed have not granted permission for the mention of their names. They include an acquisitions editor for an active Christian publishing house, and a literary agent widely recognized in the publishing industry. This page was last modified on 15 September 2018, at 15:37. This page has been accessed 9,968 times.